Today's post is for those women who are keen for their health when it comes to the intimate area. Skin care has been a popular topic especially among women, but if you ignore caring for the skin of your most delicate private part its simply unacceptable by your body. So I am sharing with you my views on a product meant for promoting intimate health of women. I would review Lady Hygiene Wash from Anherb in this post. Price: Rs 210 buy here and also available at many online stores. Qty : 120ml + 12 ml extra. When to use: Use Daily during bath or anytime during the day when you want to feel fresh. Can also be used 3-4 times in a day during monthly periods. No more worrying about bad odor. Go closer to your friends and family with confidence. 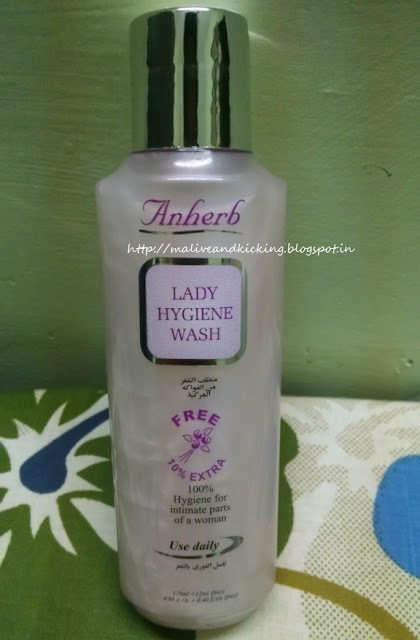 The Anherb Lady Hygiene Wash is a pearly white cleanser that comes in a transparent bottle. 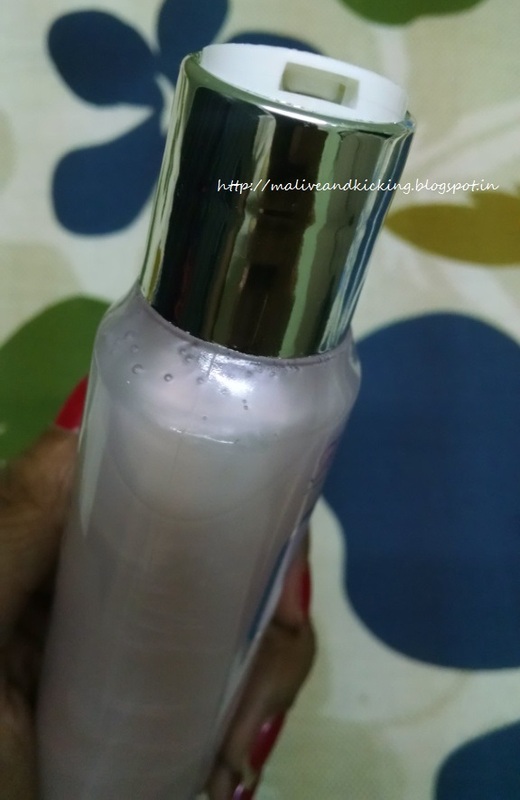 I loved the eye-pleasing color of the bottle in light purple that is not identical to most of the products I have used from the brand earlier. The bottle has press-to-open kind of cap that comfortably lets you eject the required quantity in every usage. The texture of the intimate wash is like a usual shampoo and it smells very nice and gives a feminine feel as you sniff it. The cleanser sufficiently foams as it comes in contact with water and does its job of keeping the intimate area fresh and infection free. 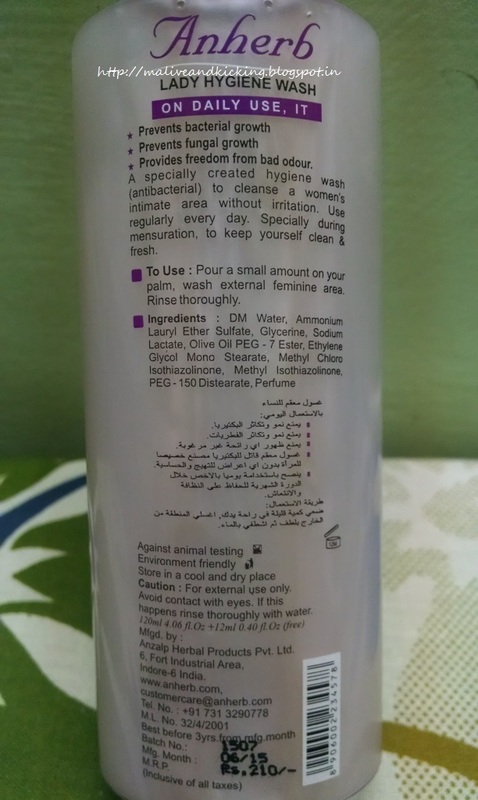 As the product claims to be mild on skin and also promises to maintain acidic pH necessary for problem free intimate area, I use it everyday while taking a shower for a healthy well being. Using this cleanser during mensuration is one of the best way to provide yourself a odorless feeling all day long without being conscious of unpleasant smell. My advice is to use it atleast twice a day on those days of every month. Since the cleanser is enriched with olive oil and milk extracts, it doesn't make you feel itchy and stretchy in your intimate area rather moisturizes it delicately. Gives freedom from bad odor. May not be easily available offline. Overall, the Anherb Lady Hygiene Wash is one of the easiest means to enjoy a confident feel without botheration of bad odor. It stands to its claims and I recommend it to every woman. excellent blog. A fantastic read. I'll certainly be back.